Elisabeth Schultz Kehler (1866-1943). Preservings photo. 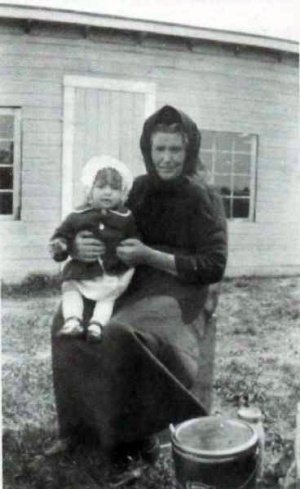 Elisabeth Schultz Kehler: Mennonite pioneer; born on 30 March 1866 in the Bergthaler Colony, South Russia. She was the fourth of ten children born to Aron K. Schultz (16 April 1834-22 March 1924) and Maria Harder (1839-1900). As a young adult she was baptized into the membership of the Bergthaler Mennonite Church but later in Canada was a member of the Sommerfelder Mennonite Church. In 1884 she married Jacob K. "Berliner" Kehler (1863-1923). Together they had 13 children (four daughter and nine sons) of which 11 survived to adulthood. Elisabeth Kehler died on 10 February 1943 in Steinbach, Manitoba. At the age of nine Elisabeth came to Canada with her parents as part of a large Mennonite migration in 1875. They settled in Hochfeld, Manitoba where Elisabeth grew up and attended school. At the age of 18 she married Jacob Kehler, who was an outgoing character known for his quick wit and magnetic personality. Initially Elisabeth and Jacob K. Kehler moved to Ebenfeld, Manitoba where they farmed until Jacob died of stomach cancer in 1923. Elisabeth continued to manage the farm until 1926. She then sold the farm and moved to Steinbach to live with her youngest daughter. Elisabeth was a faithful Mennonite but in her old age was unable to attend church regularly as there was no Sommerfelder church in Steinbach. As the mother of 11 children, Elisabeth enjoyed many lively large family gatherings with her grandchildren and great-grandchildren. Memories of this hardworking, faithful matriarch who endured the struggles and hardships of pioneer life without complaint will continue to be an inspiration for future generations. Reimer, Al. "Elisabeth Schultz Kehler (1866-1943)." Preservings (June 1997): 28-30. Brown, Sharon H. H. "Kehler, Elisabeth Schultz (1866-1943)." Global Anabaptist Mennonite Encyclopedia Online. June 2006. Web. 24 Apr 2019. http://gameo.org/index.php?title=Kehler,_Elisabeth_Schultz_(1866-1943)&oldid=92251. Brown, Sharon H. H. (June 2006). Kehler, Elisabeth Schultz (1866-1943). Global Anabaptist Mennonite Encyclopedia Online. Retrieved 24 April 2019, from http://gameo.org/index.php?title=Kehler,_Elisabeth_Schultz_(1866-1943)&oldid=92251.